Google started to test a unified menu in the latest Chromium and Google Chrome dev builds. The new menu includes most of the options that were available in the page and tools menus. If you use a recent Chromium build or Google Chrome dev channel, you can enable this feature by adding a command-line flag to the desktop shortcut: --new-wrench-menu. To make the menu more compact, Google uses a single menu item for cut, copy, paste and another menu item that combines zoom options with full-screen. Opera already uses a unified menu that replaces the menu bar, while Firefox 4 will include a single menu button. The unified menu takes up less space, it's less complex and it reduces clutter. "The general purpose of the menubar is to contain all of the things that you want your program to do but you can't cram into the main UI. So the menubar generally ends up with a lot of stuff that isn't used very often, if at all, and yet is reproduced on every window and takes up a significant amount of real estate. It also has the tendency to become a dumping ground for new or hardly used features. Starting with Vista, and continuing with Windows 7, the menubar has been systematically removed from Windows applications built by Microsoft and other vendors. It has been replaced with alternatives like the Windows Explorer contextual strip or the Ribbon found in Office 2007," explains Mozilla's wiki. Pretty pointless for the mac version, seeing as the menu bar stays there regardless. Good. I can never remember which function is in which of the two existing Chrome menus. For what it's worth, I've been doing the same with Firefox 3.6, via the Personal Menu extension. As an added bonus, the extension allows me to remove items I don't need and rearrange them to my liking. Yeah, I think this is a good idea. When wanting to do something I always end up choosing the wrong button first, then having to open the other. A very strong point for Google Chrome is that it is cognitively light. Even if Firefox has become a lot faster lately, it just feels too bulky. I am glad the community behind Firefox now recognizes that, and is changing it's UI. I am especially glad to see that they chose to put tabs on top. This proves that the extra competition from Chrome in the browser market has a positive impact on the evolution of other browsers. "As noted on the 3.0 Windows Default Theme Issues Wikipage, Firefox feels dated and behind on Windows. Especially Vista and Windows 7." That's not a compliment for other operating systems :D That's my main issue with alternative operating systems, out of the box they feel bulky and dated (and sometimes too brown). Maybe Chrome OS will have a comparable impact on open source operating systems? IMHO, anything which is inconsistent which Windows on Windows environment is not user friendly. As one guy said above, I too always used to select wrong drop-down for selecting any option. Now it will be even worse as I will have to search for that option in the drop-down menu. I am not gonna stop using Chrome for this but I still don't feel this is the right choice. Good idea to unify them. Like others, I too have to guess at which menu to use sometimes. They really should add 'extensions' on the menu too for more exposure. Most people still have no idea what (or where) extensions are - based on the # of current extensions installed. In this phrase: "an unified menu", it should be "a unified menu". Even though the general rule is to use 'an' before a word starting with a vowel, it is actually the spoken sound that governs whether you use a or an. Extensions is now buried under tools... they should move it back into the main wrench menu. If they are looking to save space, they should remove "Other Bookmarks" and/or make it an option. That takes up more space than anything (except for the URL bar). It also would be good to be able to hide extension icons that are next to the wrench menu. Some extensions offer the option themselves, others stay there for no reason, without an option to hide them. I like to keep a clean interface, without some ugly icon from an otherwise useful extension. I like the way Windows 7 has implemented this for the System Tray. I like it. The only reason I use the Page icon is to create a application shortcut, and that's something I rarely do. Most options that I use in Chrome are in the Wrench icon. Would be nice to add an option to list just a user-defined tools and options in the Wrench menu, but that's probably not possible? Where is the Application Shortcut option now? I love the continued simplicity. I do agree that "extensions" should be more prominent, and things do feel a little cluttered at the moment. But, the change's not even on by default in the Win dev versions yet, so I can't complain. I have 6.0.450. Before this article I thought I lost the age menu because I get only the Tools page. Now I understand : on my netbook (1024*600) I see only the Tools icon and not the 3 others ! Why, is the question. 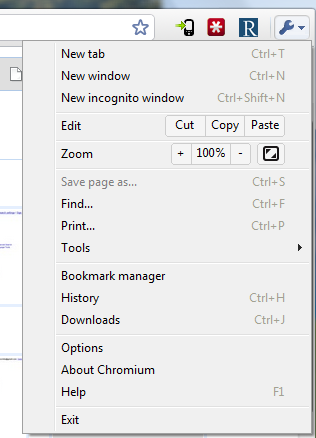 I am on Chromium 6.0.450.0 (50790). Thanks to the tip, I now see the new wrench icon and the shortcut works fine too (Alt + F). However, pressing the shortcut for the old Page menu (Alt + E) crashes the browser. Or is it just me? I am seeing the same as Láďa Říha, seperate Cut, Copy and Paste buttons, and also 3 seperate zoom buttons, making the whole thing quite unwieldy. It's combine all of the Tools! Big question is - how do you get 6.0.450.0? I'm still seeing 6.0.447.0 on the blog and via the about screen update feature. It doesn't work for me. I added that to the end of the line in the properties of the desktop shortcut that includes the .exe for chrome, but it looks that same as before. as the single menu gets more complex, have you thought about going into the direction of moving away from an ordinary menu, more into the likes of office 2010 backstage tab? extensions and all directly there. it would result in the menu being only the most needed things (exit is not needed there f.e., extensions, history etc wouldn't be needed there anymore). i'm talking quite randomly now, but i'd prefer an evolution into that direction. menus for me are always clumsy as they don't fit the rest of the window or ui, and are always quite small and fiddly. You must not have noticed that Opera has started to look A LOT like Chrome lately. Flock has moved to the Chromium platform and now Firefox is bringing a Chromy interface. Safari even planned to do the whole tabs on top thing in version 4 but then abandoned it. the mnemonics keys are gone? Opera had tabs on top before Chrome even existed. There was a way (Alt+F11) to get rid of menubar before Chrome even existed. Opera was first with full content search from address bar. I'm another 6.0.447 that still sees the standard 3 fields - copy,paste, cut and the same for Zoom option. The screenshot is from Chromium 6.0.452. Hm. I'm "up to date" with 6.0.447. Any way to force a download? Chromium is actually a different browser, it's the open source project that powers Chrome. You can download a snapshot ("nightly build") from this page. Make sure you download a build for your operating system and you scroll to the bottom of the page to download the most recent build. Chromium's builds might be even buggier and less stable than Chrome Dev Channel builds. How do you add this for us mac users? I am running the Dev build, and I preferred the previous way. Is there a way to change this without downgrading? That would only be temporary as they would update the others soon. I lost "Create application shortcuts" any idea for resolving this important functionality ? Snap, I want "Create Application Shortcut" back!? I think having page options and tools as a separate menus is a cleaner and more intuitive convention. If you want to argue screen retail, how about moving `google translate` and `send this link with gmail` into the page menu where they belong. People who use those often should know the hotkeys and don`t need the icons. Now the menu is bloated and is likely to get more bloated. I HATE YOU! IT IS SOOOOOOOO NOT A GOOD IDEA TO CHANGE IT! HOW CAN I CHANGE IT BACK? !